High Quality Content by WIKIPEDIA articles! Neuraminic acid (5-amino-3,5-dideoxy-D-glycero-D-galacto-non-2-ulosonic acid) is a 9-carbon monosaccharide, a derivative of a ketononose. Neuraminic acid may be visualized as the product of an aldol-condensation product of pyruvic acid and D-mannosamine (2-amino-2-deoxy-mannose). 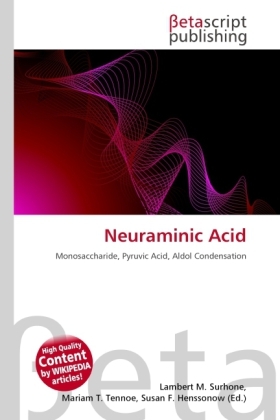 Neuraminic acid does not occur naturally, but many of its derivatives are found widely distributed in animal tissues and in bacteria, especially in glycoproteins and gangliosides. The N- or O-substituted derivatives of neuraminic acid are collectively known as sialic acids, the predominant form in mammalian cells being N-acetylneuraminic acid. The amino group bears either an acetyl or a glycolyl group. The hydroxyl substituents may vary considerably: Acetyl, lactyl, methyl, sulfate and phosphate groups have been found.